Twitter has struck gold once again and has spent the last 24 hours ripping United Airlines a new one. So far the airline has issued a “Sorry, we’re not sorry” apology for literally dragging an Asian doctor, David Dao, off an overbooked flight—that he had nothing to do with. And, of course, there are some outlets already reporting on Dao’s past. 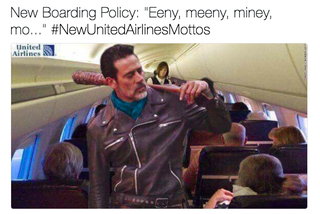 But people on social media have taken time out of their busy days to give you #NewUnitedAirlineMottos, because, why not? As for the security officer involved in dragging Dao off the plane? The Chicago Department of Aviation has placed him on leave.